4.3 out of 5 based on 27 bloggers and 6 commenters. 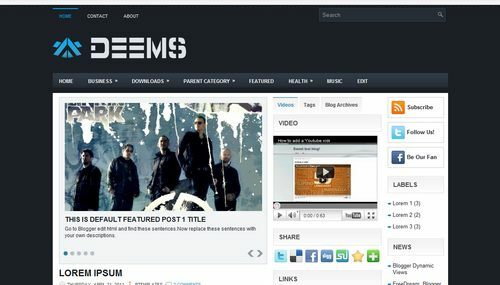 Deems is a free blogger template adapted from WordPress with 3 columns, magazine-styled, right sidebar, ads ready, footer columns, slider, posts thumbnails, tabs and drop down menu. terimakasih,,, atas tamplate deem y…. good luck. Nice template but I need help here coz the date are not shown in the post. Only time is shown. Anybody can guide me how to show the date+time in the post? How can i have more posts in the pages of 2,3…. ?